This is my nail for the week but I would be replacing them soon because I think I applied the nail polish too thick that's why when I took a bath this morning and washed my hair, it kind of left this streaks on my nails and they look ugly; but I love the design I did with my nails so I might do this design again but using a different shade of pink. For this nail of the week, I used the Etude House Matte Pink Nail Polish and it's kind of hard to apply that's why it doesn't look very neat. 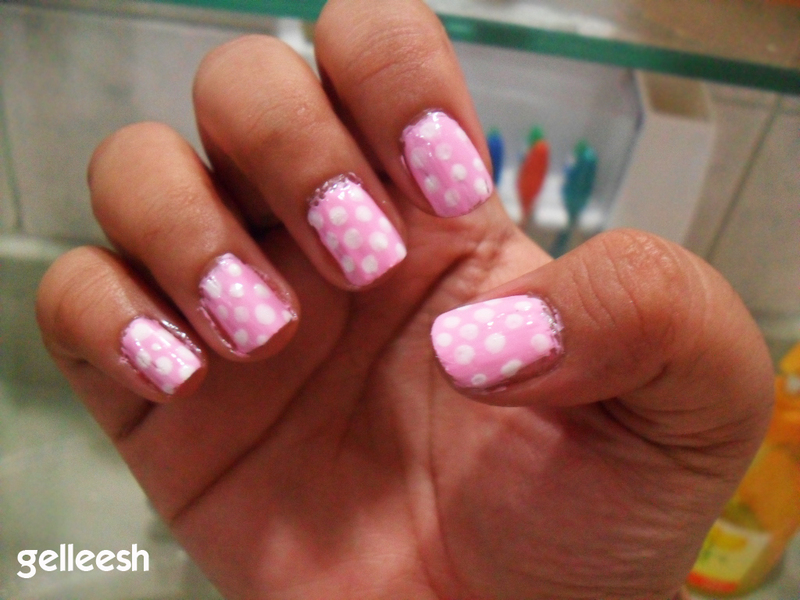 For the white dots, I used a Caronia White Satin Nail Polish and applied it using the rounded tip of a bobbi pin. I got this technique from blogger, MissKatv. Before I start applying the nail polish, I used first the Caronia Nail Hardener and Base Coat and then after applying the nail polish, I topped it with the Caronia Fast Dry Top Coat. I will be posting the part two of my nail of the week and I'd be using a different shade of pink so I can apply it easier. I kind of find it hard to apply the matte nail polish; but I so love the color. Hope you like the design just don't mind the application much. Haha!